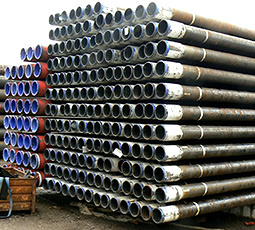 Correct stacking of OCTG is vital in the interests of avoiding damage to, and distortion of pipe whilst in storage. General hints on good practice are pinned to the Info Board. 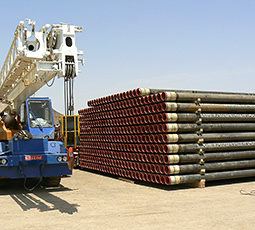 Correct stacking in desert location with mobile crane rather than fork-lift. 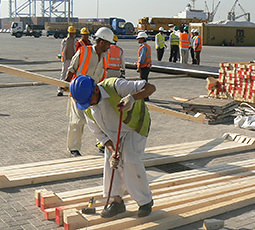 Cranes are required where the yard surface is non-compacted or uneven or where levels vary across the yard. 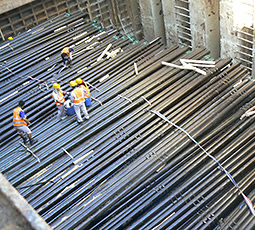 Correct clearance under stack provided by concrete bearers with timber dunnage under the stack. 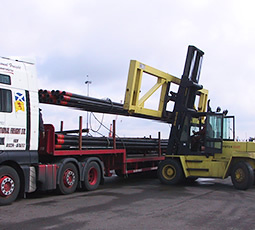 Fork lifting is ideal for secure handling of casing in a stock-yard with good flat concrete or tarmaced surface. 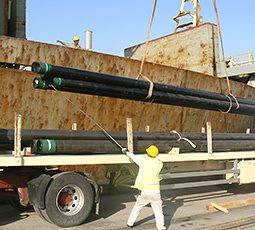 It is always important to load to vessel hold securely and safely, both to avoid movement in hold and damage to cargo. 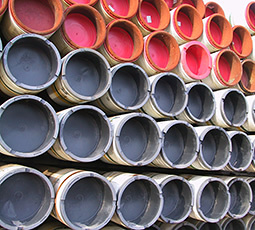 Protectors should always be checked for tightness when the pipe stack is made up. 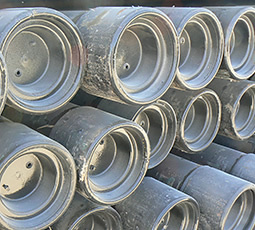 This prevents the ingress of rainwater and dust. 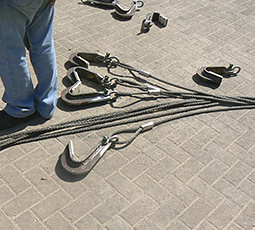 Loading to trailer. 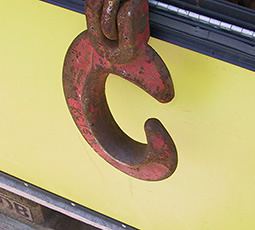 The load must be kept below the top of the head-board. 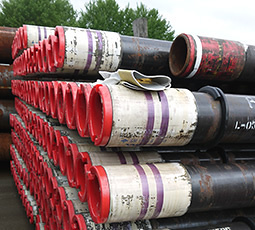 Closed-end liftable protectors with weep-hole to prevent the build-up of pressure inside the casing joint due to temperature variation. 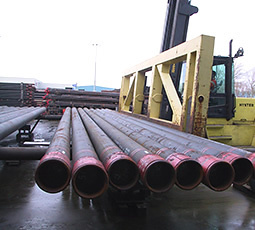 Flat-faced nylon-lined pipe hook should always be used for handling single joints of casing. Bundles should always be slung. 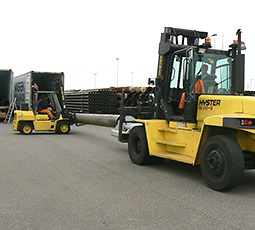 Loading and discharging of containers, particularly conventional end-opening containers, needs to be done with extreme care, both to avoid damage to the cargo and to avoid injury to operatives. 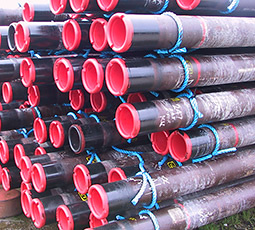 The photos show the loading of a joint of plain-end conductor. 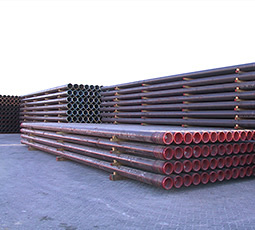 To load single joints or bundles of casing it is necessary to sling the pipe and to support it on the loading unit from a heavy scrap casing joint used as an extension to the lifting unit. 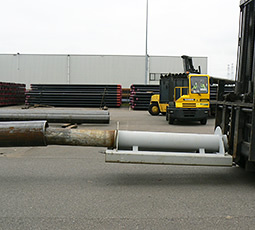 Small fork-lift aligns pipe joint with container. 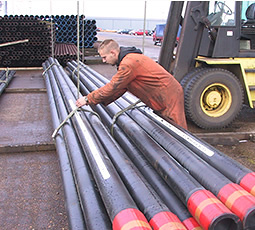 Heavy fork-lift insets the prong of the lifting unit and takes the weight of the joint. 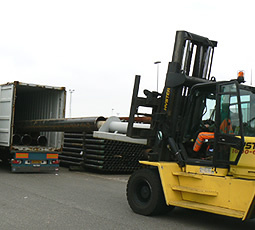 Heavy fork-lift loads the pipe to the container.